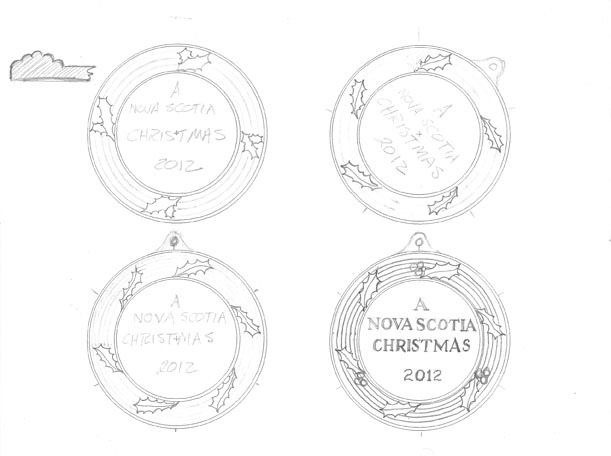 Now on to the making of the ornament. 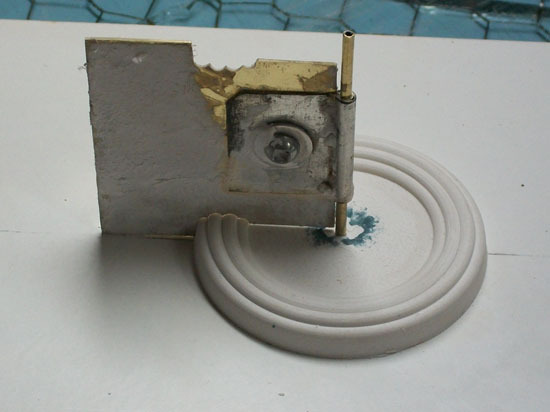 What you need to do is make an exact replica of the ornament in plaster. The plaster ornament has to be as perfect as possible with no bubbles or bumps or uneveness any where. 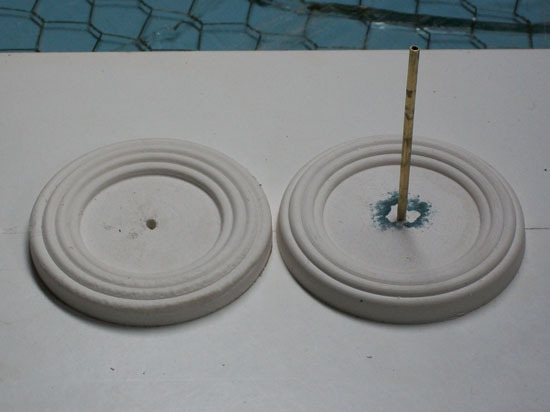 I will use this “model” to make a rubber mold from, that I can then use to cast all my working plaster molds. I am using an old plasterers technique to make the plaster blank with rings around it’s edge. A lot of the decorative trim in older houses used to made with plaster, moldings and the circular ceiling details above chandeliers. I’m using that idea only smaller to make my blank. Here is the first one I made but I wasn’t happy with the result. It was too flat. I want the rings to be more domed. Here is the second blank with better rings. 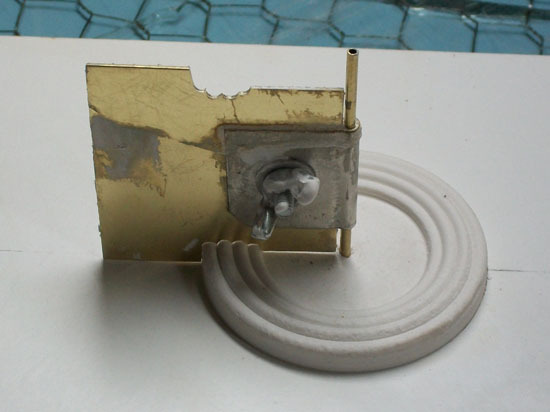 The brass template swings around the post and scraps away the excess plaster to leave the ringed model. I had to apply about 3 coats of plaster to get the final model. The rings are more domed. Here are the two side by side. As you are about to see, patience needs to be in great supply. I used the one on the right. Now that I looked at all the past ornaments, it was time to get at it. I started looking at images on the net and just picked things that immediately struck me for one reason or another. What you are mainly dealing with is the property the transparent colored glaze has. It’s a darker color when it’s thick and paler when thin. After selecting about a dozen images, I went through those again and knocked it down to three images that held something. Here they are. 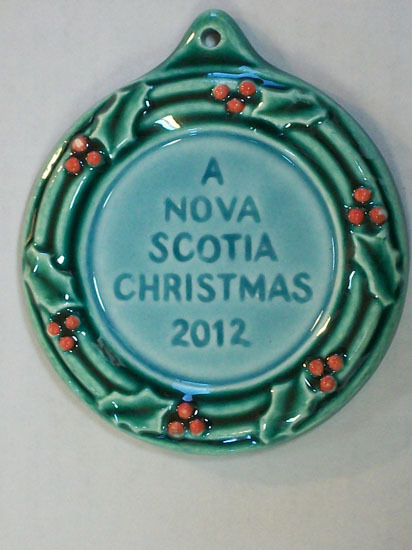 You are currently browsing the Earthenware blog archives for November, 2012.